I’m taking a virtual walking tour ‘above ground’ on the London Underground. Using my Tube guide and my fitbit® device, my goal is to walk at least 10,000 steps a day roughly following along the Underground route, reporting back here on Fridays with my findings. This is Day 15. I’ve got a rough plan. 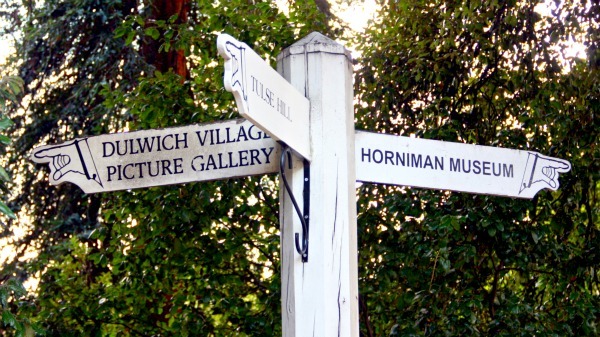 I’ve been to the Dulwich Picture Gallery and the Horniman Museum. 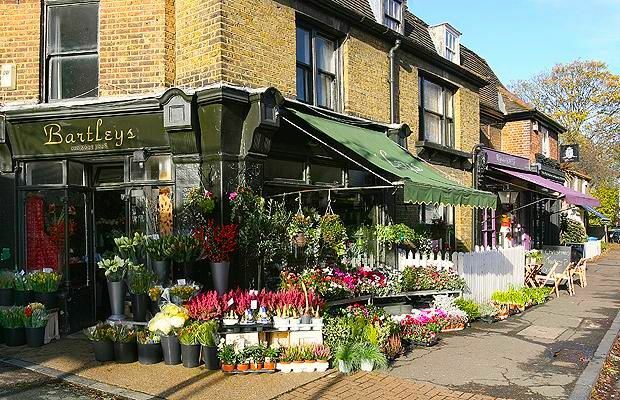 Now I just want to have a look around Dulwich Village, before I hightail it back to Kew Gardens and get back on track on the Picadilly Line. Not exactly on track as it were, being that my whole point is to walk aboveground on the London Underground route. I ask my waiter for the check and if he knows the best way to get from the Belair House—where I’m enjoying some mid morning tea—to the Village. I’ve heard there’s a bookstore there? 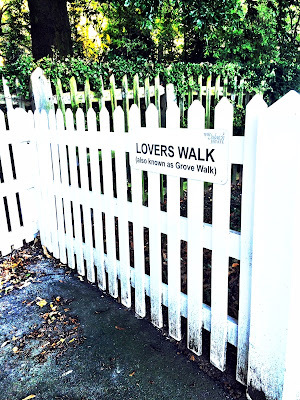 He murmurs something about Lover’s Walk. I blush and blink my head off at the idea that he’s inviting me for a romantic stroll. I should never have told him that he reminded me of the actor that plays George Gently. Did he think I was flirting? 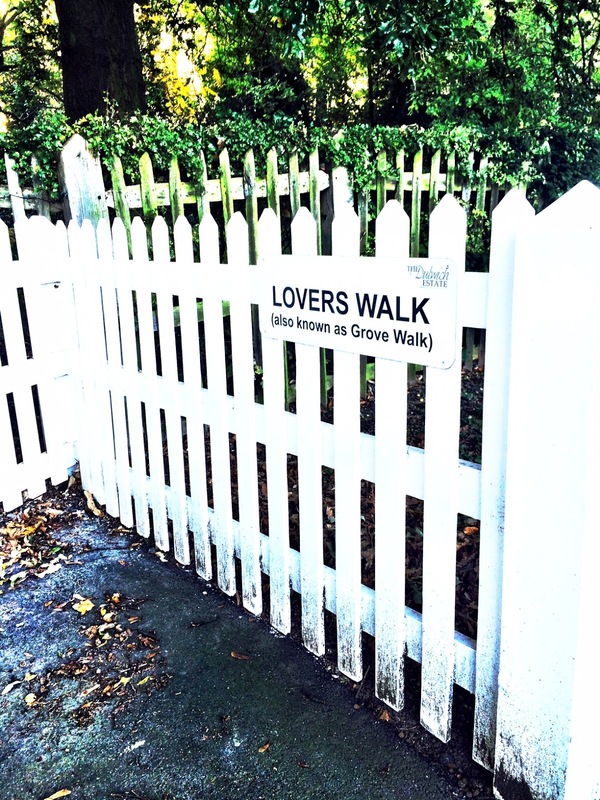 Let’s be honest, I was flirting but still, a lover’s walk is a bit much. Then I zero in on what he’s actually saying. He’s simply giving me the directions I’ve asked for. 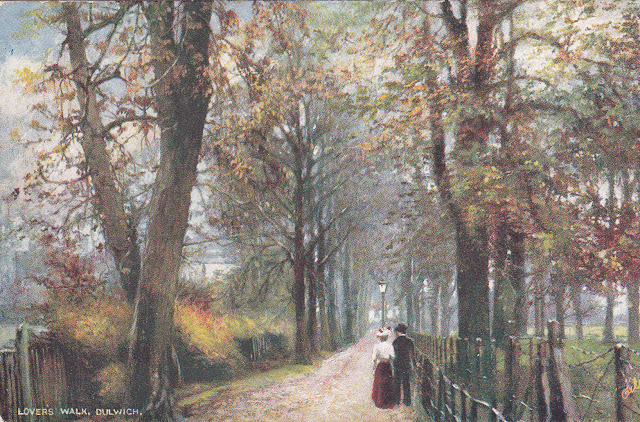 Long popular with artists, Lovers Walk with its pretty pathway has been painted and photographed time and again. In Edwardian times artists sold postcards with Lovers Walk on the front. 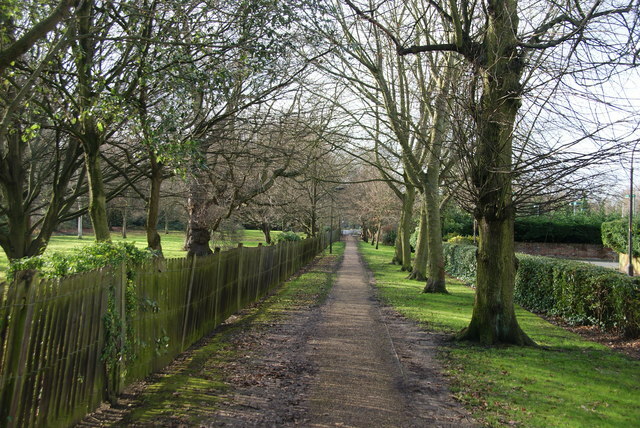 I can imagine wandering along the shady lane with a beau, hand in hand. Gloved hand, naturally. Perhaps we’d find a bench to sit for a few minutes and he’d recite some verses he’s copied out for me. Once upon a time, gentlemen, it seems, were always copying out verses for young ladies. Not that I’m a young lady, but this is my make-believe walk after all. Proceeding along College Road I pass the Dulwich Picture Gallery & mausoleum we visited last week then continue up the street, almost as green as the lovers walk, green, green, everywhere. It’s just over half a mile, about ten minutes by foot before I get to the Village. I feel like I’m walking on to a movie set. There, across the street is the Village post office with a round red postal box out in front. 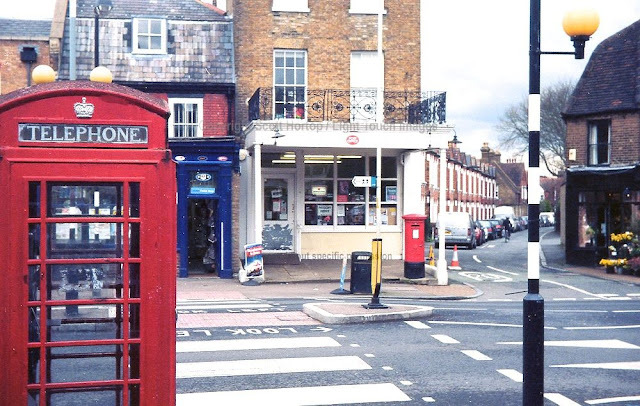 On this side, an iconic red telephone box, a throwback from the days when our phones weren’t implanted in our hands. 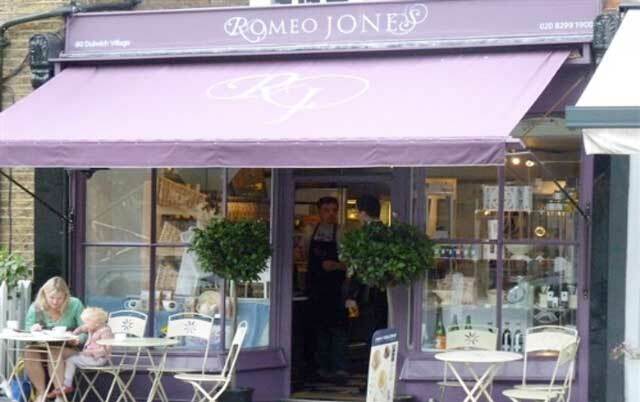 Adjacent to the post office is the local flower shop and next door to that is Romeo Jones, a cafe with a gourmet shop and deli in the front, coffee house/tea room in the back. Are you kidding me Great Britain?! How much charm can you stuff into one little village block? But GB’s not done yet. 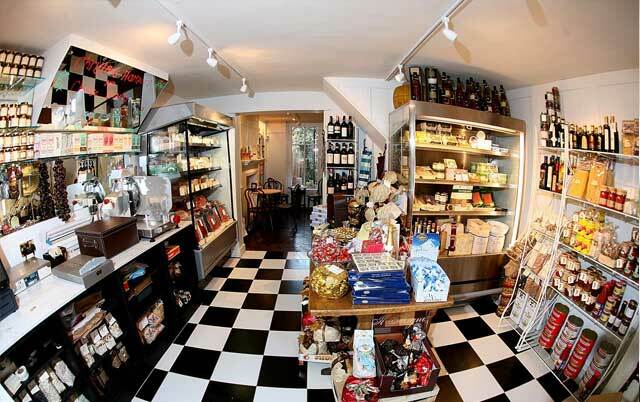 Across the street Rocca di Pappa boasts delicious looking Italian food including wood-fired pizza. FYI, dining al fresco is kind of my thing. Sitting outside on a 74 degree day with a breeze lifting gently but never blowing is my idea of heaven. 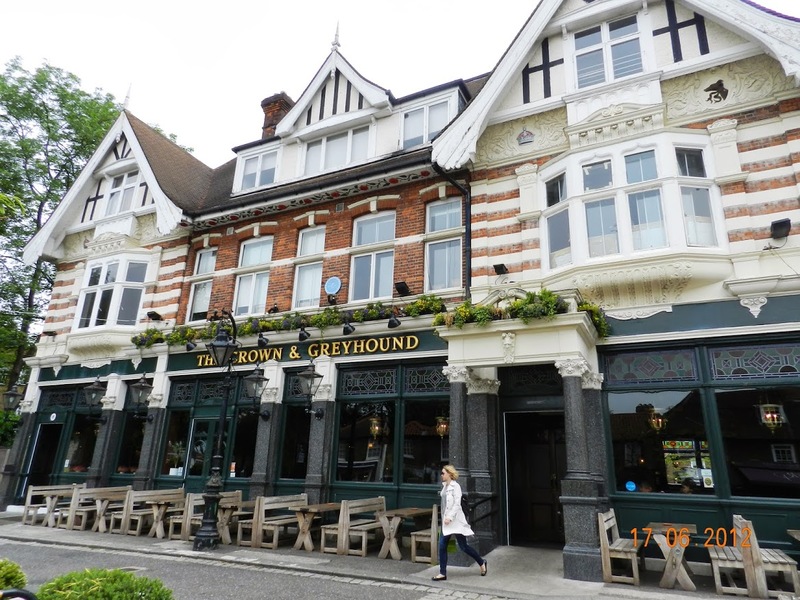 And then there’s the fabulous Crown & Greyhound. Is this not a Pub with a capital P? At the time of this writing, The Crown & Greyhound is closed for remodeling which is probably a good thing because you know what I’m in the mood for? Yep, another Shandy! I’m told by one of the workmen that the pub is reopening early in 2016 so if I’m still walking around London later this month or in February, I should come back for a pint. Just up the street and over the road is the Village Bookstore, which somehow squeezes two floors of books into its seemingly tiny space. 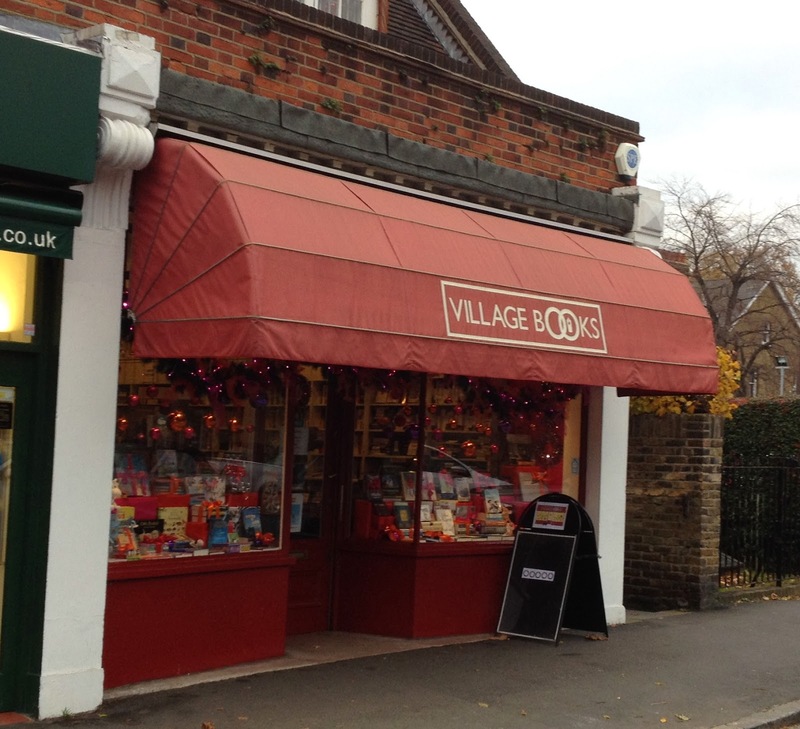 It’s a friendly little indie store where you can pick up the latest best seller as well as some Union Jack wrapping paper. I’m definitely in the market for that. I don’t know what it is about Dulwich, but I like the vibe. 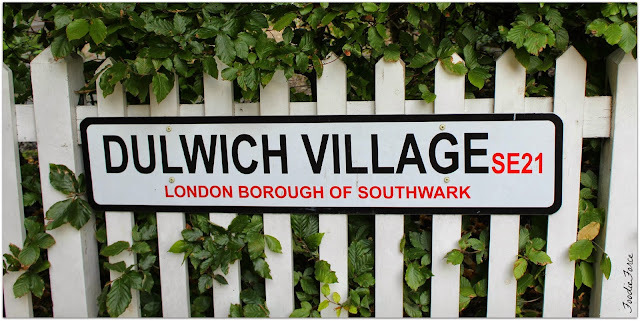 It’s not a perfect English village, Miss Marple style, but it feels fresh and vibrant yet very well-lived in. Comfortable, not overly posh. Colorful. 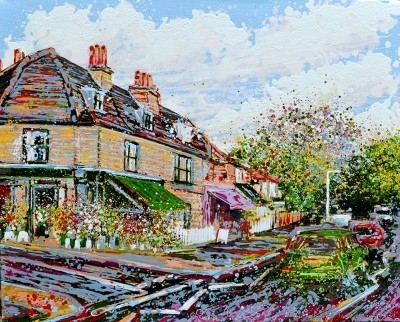 The kind of village artists want to paint. Maybe after I’ve gotten a few more Fitbit steps and miles under my belt, I'll come back and check it out as a potential place to spend a few of my retirement years. Then I notice the flyers posted in the window of the estate agent next door to the bookshop. A million pounds for a two bedroom flat in a Victorian building! Maybe I need to keep looking. It would be tough to choose a favorite here but Lovers walk looks beautiful. The pub looks like a great place to stop for lunch and pint too! I love your walk. I can imagine living near the area and shopping, dropping my letters in the little red letterbox. Beautiful! Me too! I’m going to keep my eye on the area, you never know! What a charming area! I had no idea. I suppose it wouldn't be a well-enough guarded secret for the rents to stay down.